A unique, daily-use formula, Himalaya Herbals Age Defying Hand Cream repairs and regenerates the skin, giving you younger looking hands. Cocoa Butter rehydrates and soothes the skin while Rosemyrtle and Woodfordia help increase skin elasticity, reducing wrinkles and fine lines. Spiked Ginger Lily and Greater Galangal help to protect skin from harmful UV rays, preventing premature aging. This non-greasy cream is quickly absorbed by the skin, helping you reverse the hands of time! 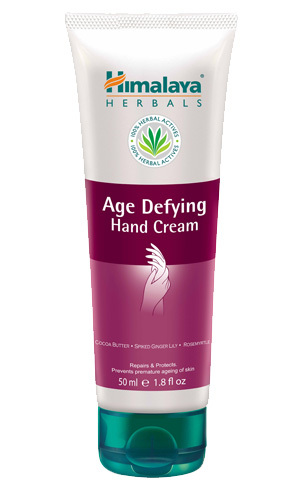 Apply Himalaya Herbals Age Defying Hand Cream liberally on hands and gently massage into skin.